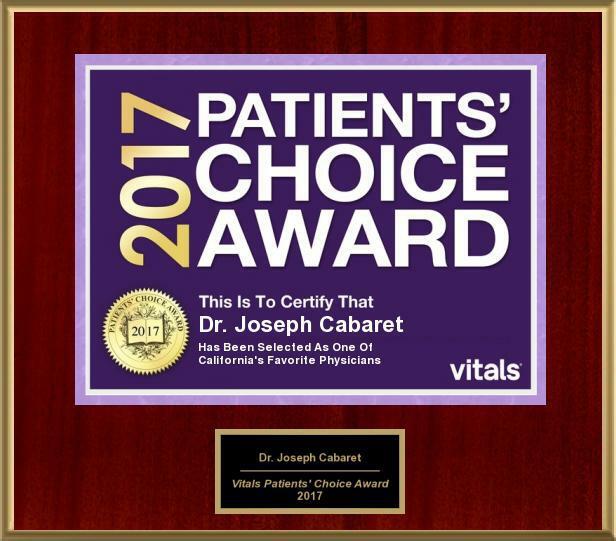 Camarillo, CA May 2, 2018 - A select few of physicians were honored with the prestigious 2017 Patients' Choice Award, and this year includes Dr. Joseph Cabaret. Only doctors who received top ratings and reviews by their patients are awarded Vitals Patients' Choice Award. With over 8 million ratings and reviews, Vitals has the largest collection of crowd-sourced data on doctors online. While other quality metrics are important to consider, patient ratings and reviews help identify doctors committed to providing skilled and compassionate care. Those are qualities that can't be overlooked: a strong doctor-patient relationship leads to better compliance with care regimes which impacts patient health. "Overall, we know people are looking for doctors that listen to them and give them a say in decisions about their own health," said Mitch Rothschild, Founder and Executive Chairman of Vitals. "Thanks to the millions of people in the Vitals community, it's easier to recognize the doctors who are doing good by doing well by their patients." Vitals Patients' Choice winners are chosen based on the number and overall rating a doctor receives from patients for the calendar year. The algorithm also takes into account other quality metrics that the provider must meet. All told, only 7 percent of doctors were eligible for a Vitals Patients' Choice award this award season.